Passed peacefully at St. Luke’s Home on Monday, February 12th, 2018. Predeceased by his parents, Chesley and Annie Hann; brother, Harold; sister, Jean; brothers-in-law, Ches Thistle and John Kennedy; nephew, Kenneth Hann and grand-nephew, Andrew Hann. 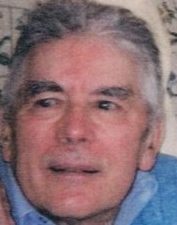 Alick was a loving brother, uncle and loyal friend and leaves with fond and loving memories his brothers, Robert (Marjorie) and William (Alice); sisters, Tess Thistle, Pearleen Kennedy, and Elsie Jarvis (Freeman); sister-in-law, Joan Hann, brother-in-law, Fred Hall; special niece, Karen Hann and a large circle of nieces, nephews, and friends, especially Marian Ledrew and all his friends at St. Luke’s. Special thank you to the doctors, nurses, and staff at St. Luke’s for their care of Alick. Resting at Carnell’s Funeral Home, 329 Freshwater Road, St. John’s, on Wednesday, February 14th from 2-4 pm and 7-9 pm and at St. Andrew’s Anglican Church, Little Harbour on Thursday, February 15th from 2-4pm and 7-9pm. Funeral service will be held at St. Andrew’s Anglican Church, Little Harbour, on Friday, February 16th at 2:00 pm. Flowers are gratefully accepted but donations in Alick’s memory are preferred and may be made to the CNIB or Children’s Wish Foundation. Karen, I am just learning of Alick’s passing. Please accept my most sincere condolences. I know how much you loved and cared for him and how his passing must have left a void in your life. May he rest in eternal peace. In thanksgiving for the life of Alick. I have fond memories of him and our times together. May he rest in peace and rise in glory. So sorry to hear of Alick’s passing, Phil has many fond memories of Alick and always enjoyed his chats with Alick over the years. May he Rest in Peace and Rise Again in Glory. Karen so sorry for your loss. I know how much you loved your Uncle Alick.